Often the biggest challenge faced by a tropical farmer is not in the production of a crop but rather in the preservation of the crop. Farmers may want to preserve a crop for future consumption or for sale at a time when the market will offer a higher price. 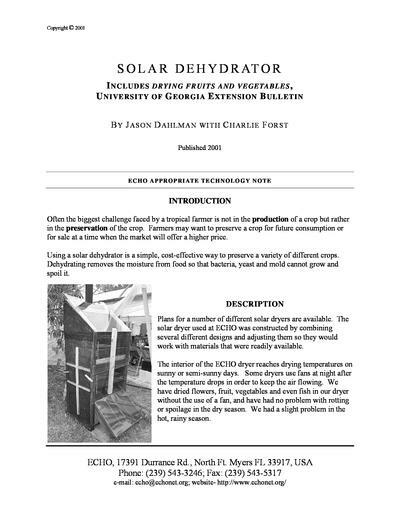 Using a solar dehydrator is a simple, cost-effective way to preserve a variety of different crops. Dehydrating removes the moisture from food so that bacteria, yeast and mold cannot grow and spoil it.